With the services they provide, Spotloan offers an alternative to payday loans for their customers. Spotloan is a short-term installment loan company that was created to provide a better solution to immediate financial needs than payday loans. Spotloan says it is not a payday lender but there are many similarities between payday lenders and Spotloan, like exceedingly high interest rates. However, there are no prepayment penalties, so if you can quickly pay back the loan, a short-term installment loan from Spotloan may help you out in an emergency. Keep reading to see if this is the right service for you. What are the services offered by Spotloan? 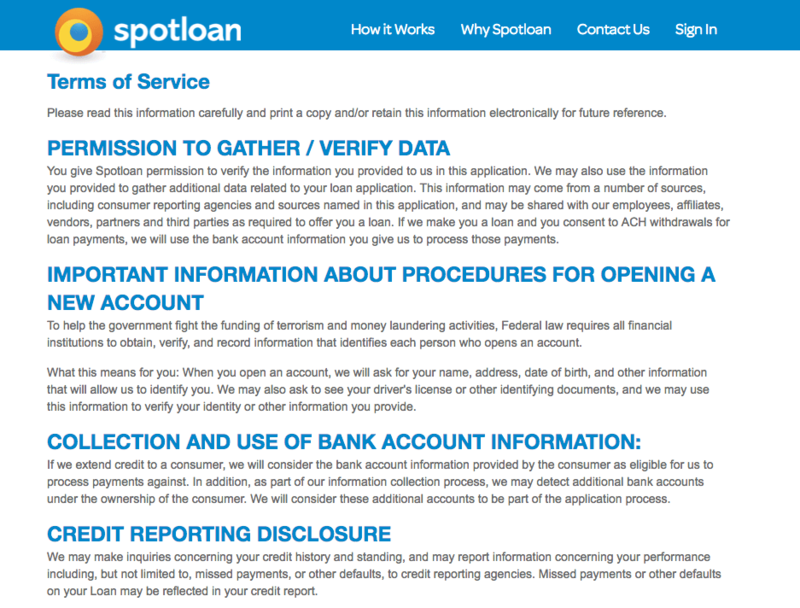 How do I use Spotloan's services? Am I eligible for the services provided? How user friendly is Spotloan and its services to use? Does Spotloan run my credit score? Or affect my credit score? How is a Spotloan different from a loan commitment? Does Spotloan report to the three credit bureaus? If so, which ones? Does not paying on time affect my credit score? The primary service offered by Spotloan is an online installment loan. Funds are available from $300 to $800 and can be received as early as the next day. You have up to eight months to pay back the loan, but with interest rates that can exceed 400% this small loan can carry big costs if you don’t pay it off quickly. When you sign up for an installment loan from Spotloan you give the company permission to gather and verify your data, and that this data might be shared with "employees, affiliates, vendors, partners and third parties as required to offer you a loan." Spotloan may also gather information relating to your bank account, your credit score, and your contact information. You also authorize Spotloan to contact you at all specified phone numbers during reasonable hours with either a prerecorded message or a live representative. To get started, you need to apply for a loan—a more indepth explanation of how to do this can be found below. To apply, you’ll first select the amount you want to borrow and a payment plan that fits into your budget. Then you’ll fill in basic information like your name, social security number, address, etc. Once you've answered the questions on the application, submit the form, and you'll know within seconds if you've been approved or not. If your loan is approved and confirmed before 8 PM Eastern Time, the funds should appear in your account by tomorrow. The eligibility requirements for Spotloan are not nearly as stringent as many other installment loan companies. You'll need a job or some other regular source of income that you can prove, a checking or savings account, a valid email address or phone number, and you must be at least 18 years old. These loans are available in all states except Arkansas, Minnesota, New York, North Dakota, Pennsylvania, West Virginia, and the District of Columbia. 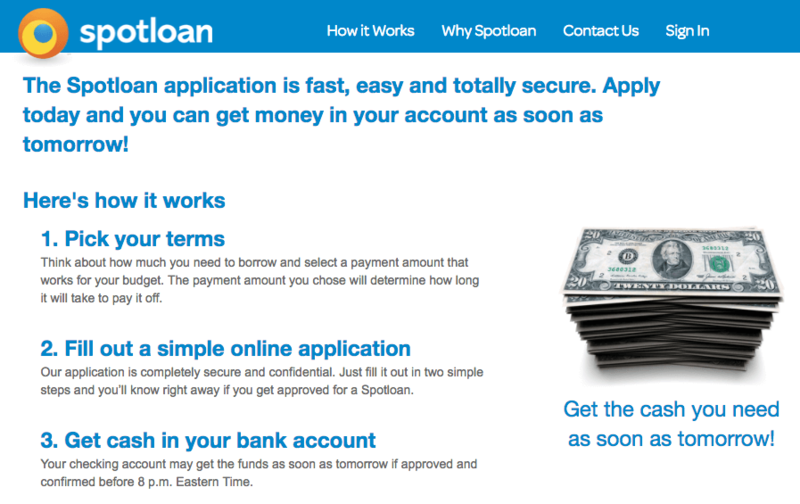 Spotloan is set up so that the application process is simple and transparent. There are no confusing terms to remember, and the form can be viewed easily on almost any browser. After the signup process, you'll receive a phone call from a designated relationship manager to help you complete the process. The Spotloan customer service attempts to go above and beyond. Each applicant is given a dedicated "Relationship Manager" to keep them up to date with the progress of their application, as well as to answer any questions that may arise during the process. Spotloan lists only three ways to get in contact: via phone, traditional mail, or email. The website does not list their hours of operation, and the email address is a black-hole help@spotloan.com address. While we appreciate what the company does with its relationship managers, making the contact information more readily available and listing out the necessary information would win Spotloan even more points. Spotloan is owned by BlueChip Financial, which is a tribal entity owned, governed, and organized by the Turtle Mountain Band of Chippewa Indians. The tribe is recognized by the federal government and operates out of their reservation in North Dakota. The company fills a gap in the market by providing installment loans over a longer period of up to eight months. Spotloan lends via BlueChip Financial and other affiliated brands of the Turtle Mountain Band. The company abides by all applicable tribal and federal lending laws, provided they do not interfere with the sovereignty of the tribe. These laws include the Federal Truth in Lending Act, the Equal Credit Opportunity Act, the Fair Credit Reporting Act, the Electronic Funds Transfer Act, the Gramm-Leach-Bliley Act, and any relevant regulations. Is Spotloan safe to use? Spotloan can share your personal information for everyday business purposes and you cannot restrict this sharing. Spotloan can share your personal information for their marketing purposes and you cannot restrict this sharing. Spotloan can share your personal information for joint marketing with other financial companies and you cannot restrict this sharing. Spotloan does not share your personal information for their affiliates' everyday business purposes. Spotloan does not share your personal information for their affiliates to market to you. Spotloan can share your personal information for nonaffiliates to market to you, but you can restrict this sharing. That said, the company does take steps to protect your personal information, including the use of "security measures that comply with federal law." According to Consumer Affairs, Spotloan scores 4/5 rating in overall customer satisfaction. Spotloan is transparent about their rates and policies. Spotloan has easy repayment options. Spotloan has a quick turnaround time with no upfront fees. Before applying for a loan through Spotloan, there are several weaknesses you should be aware of. Spotloan offers may not always be the most competitive. You must wait for Spotloan to contact you before you can complete your application. Spotloan's APRs are competitive but still painfully high. Many customer complaints revolve around the interest rates and repayment process. While it is possible to repay the loan early, it can be extremely difficult to do so. While the company is designed to help fill the gap that payday loans create, it is still a lending company and will use whatever means necessary to receive repayment. The company is based out of Native American land, which means it does not necessarily have to follow the laws of your state of residence. Read the contract and fine print carefully before agreeing to a loan. If you fail to repay the loan on time or don't bother to read the fine print, you may find yourself repaying the loan amount two or three times over. Yes, Spotloan will check your credit score. While a single check isn't likely to affect your credit score, too many checks within a limited window of time may cause you to appear as higher risk and lower your overall credit score. Spotloan is no different than a loan commitment. Although it is an installment loan that can be paid off in smaller increments over an extended period of time, Spotloan is still a lending agency, and any funds you receive are considered a loan. While these may be a better alternative to payday loans, it is still best if you can avoid missing a payment and take steps to ensure that all repayments are made on time. Spotloan does not report on-time payments to the credit bureaus, nor does it report applications. However, if you default on a loan, your credit score will be affected. The extent to which this affects your credit score will depend on a number of different factors, but defaulting on a loan should be avoided at all costs. Late payments may be met with additional fees, more interest over the course of your loan, and a $10 fee if you autopay with insufficient funds. If you can't make a payment within 90 days of your scheduled payment date, you'll default on the loan and face more severe effects on your credit score. Missing a payment here or there won't affect your score, but defaulting will. While we will always argue against a payday or short term loan, we understand that emergencies arise. If you have money coming in soon and you will be able to quickly repay your loan in full, then Spotloan is an option. However, if you're unsure of your ability to pay, only rely on Spotloan as a last resort. It is far better to dip into your savings or to borrow money from a trusted friend than to potentially place yourself at the mercy of high APR rates.